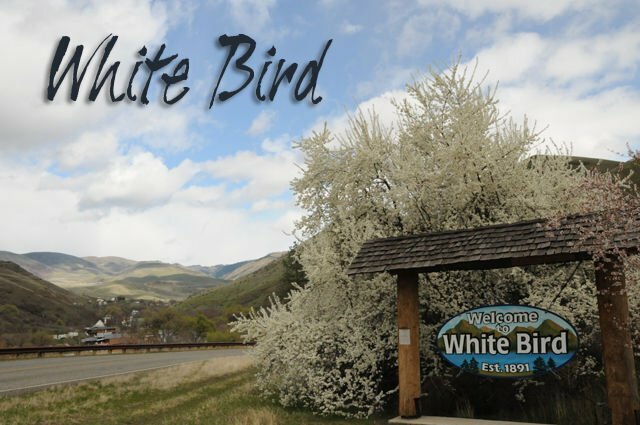 WHITE BIRD -- The weather, ever changing, looks like it could be mellowing out just a little. There has been much talk about the time changing, staying with Pacific Time or changing to Mountain Time, but we will still be doing the Daylight Savings Time on Sunday, the 10th. We “spring" ahead one hour, so don't forget! The first of the month meetings to remember are food pickup on March 7 at noon; March 11 is the WBARD meeting at 7 p.m.; city council meeting will be on the 13th at 6 p.m.; and the SRAG will hold their meeting on the 14th at 10 a.m. The chamber will hold a meeting today, March 6, 10 a.m., at the Hammer Down office to go over this year's grant proposals. Then the regular is scheduled for March 20th (different date), 10 a.m. at Hammer Down office. Upcoming activities start with March 16 and 17, the March Madness Art Show and Sale at the WBARD Building (new place) from 8 a.m. to 3 p.m. This is sponsored by the Salmon River Art Guild. The library will also be holding a bake sale that day, too. March 17 will be the Joe Wilson St. Paddy's Sausage Feed at the IOOF Hall in White Bird, starting at 7:30 a.m. and running to 12:30 p.m. (PST). The Old-Time Fiddlers will be playing during this time, and there will be an $8/person charge for the breakfast. Children 5 and younger will be $4. There are also extra chubs of sausage up for sale at $13 each. They would like you to call Canyon House if you would like extras. This is great sausage and is locally done. Then on the 23rd, join the White Bird Rodeo Committee for their queen tryouts, dinner, dance. It all starts at the rodeo arena for the tryouts at 2 p.m., then come into town from 5-7 p.m., they will be serving a spaghetti dinner with the trimmings at the IOOF Hall, following with the music of Joaquin, Verna and Dave. Crowning of the 2019 rodeo queen will take place during the evening. Dinner cost will be $7/Adults, $3/children and a $5 cover for the music. This is a fund-raiser to help put on the 30th annual rodeo. Then on March 21 thru the 24th, the chamber will be at the Big Horn Show in Spokane to help promote the area businesses. For more information on this, call your chamber president, Homer. A memo from the Rebekahs, they are putting the word out for their 2019 Royal Gem Rebekah Lodge No. 13 scholarship. This is open to any 2019 graduate from high school or home-schooled, living in the 83554 zip code. If you have a future plan in attending a technical school, the military, or college, then we would like to have you apply. Deadline is March 23. Contact Beverly McCool, secretary, at 208-507-2669. A special scholarship fund is set up for donations or memorials, and can be sent to the Rebekah Lodge No. 13, PO Box 200, White Bird, ID 82554. Week eight of the White Bird Gun Club shoot saw the weather cloudy and sunny. We had 25 shooters with Bill McMahon and Don Sickels shooting 25s, and Jim McMahon shot a 24. Youth shooters were Kaycen Sickels shooting a 21, Trevor Early shot a 13 and Trayven Sickels shot 16. Pinochle winner was Bob. Cribbage winner was Gary. Birthdays wishes go out to Treana Hanson, Mick Hanson, Jeannie Fitch (10th), Stephanie Reese, Jake Ingerson, Brooklyn Basler (11th), Kathy White (12th), Ed Carlin, Paula Koch (13th), Patty McGarvin, Brandon Cook (14th), Carol Fee, Colt Schacher (15th), and Travis Chandler, Pardner Jack Marek (16th). In memory of Lonnie Lee (12th), John Marek, Judy Reese (15th). Anniversary wishes go out to Mike & Pat Witt (10th). TidBits: Eliminate Daylight Savings Time? Idaho will keep springing ahead and falling back, for the time being, the state's House of Representatives decided on Friday, Feb. 22nd. The bill died with a 15-54-1 vote. The argument was that eliminating daylight-saving time could inconvenience cyclists, hikers, and other recreationists who like to spend their evenings outside. "In the summer months, they work all day, and expect to take that time afterward to be able to enjoy outdoor recreational pursuits". And it could cause outdoor recreation businesses to lose money. So, for the time being, spring ahead and let's hope this will hint that the snow is supposed to disappear....one can only hope! BOISE — Idaho will keep springing ahead and falling back, for the time being, the state’s House of Representatives decided Friday, Feb. 22.